Welcome! If you are coming over from Annie’s of Zevy Joy, I’m so happy to have you visiting here today! Wasn’t Annie’s table stunning…the colors were gorgeous! So I’ll be very honest, it’s been the most dreary, wet winter I can remember in a very long time…and although my heart is set on SPRING’s arrival, it’s a wet, muddy mess outside. The only good thing about all the rain is that the trees are beginning to bloom. However, every time I needed to cut some branches for this Easter table, it was raining. And raining. So, I had a few sweet friends reach out to me about a local grocery store with fresh flower bundles on sale for $1 and $2 a piece (after Valentine’s Day specials). Well, of course I went to see what I could find. And I was thrilled to purchase these baby’s breath and hydrangeas for $4! It’s just what I needed to put this simple tablescape together. 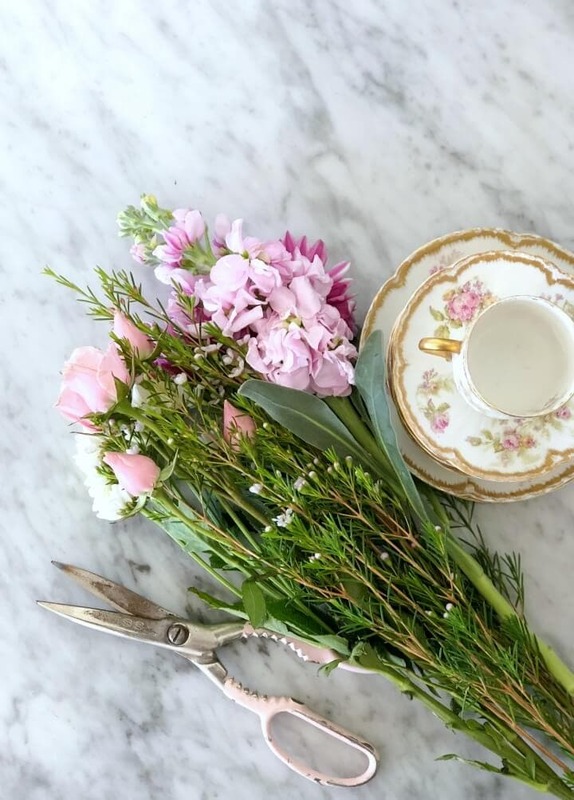 I don’t really use the traditional rabbits or eggs to decorate for Easter…I usually just use flowers, for more of a Springtime theme. 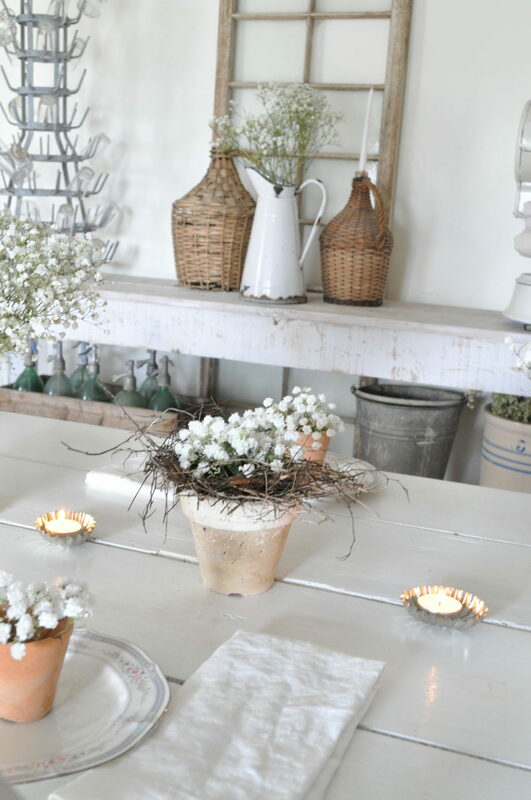 I gathered china, clay pots, linen napkins and a bird’s nest from a tree to highlight the fresh flowers. 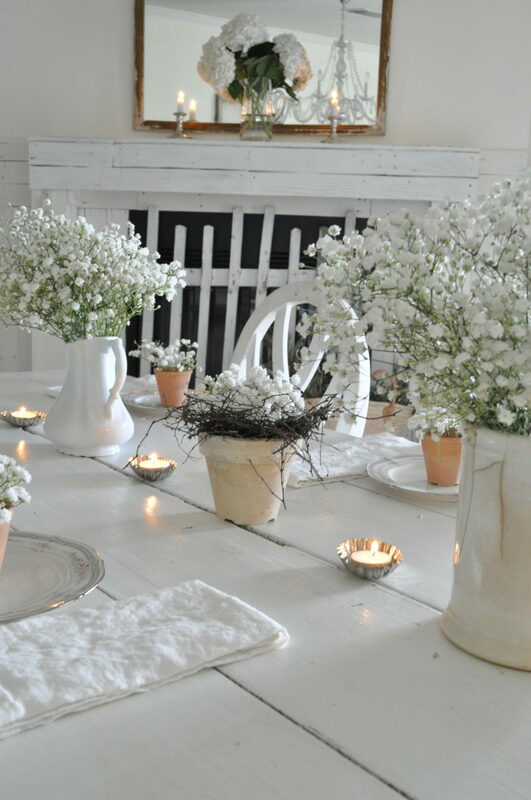 Baby’s breath looks sweet in the real nest, sitting in a clay pot with ironstone pitchers on either side. I filled each tiny clay pot for place settings and put tea light candles down the center. The hydrangeas are on the mantle in a glass pitcher with candles. 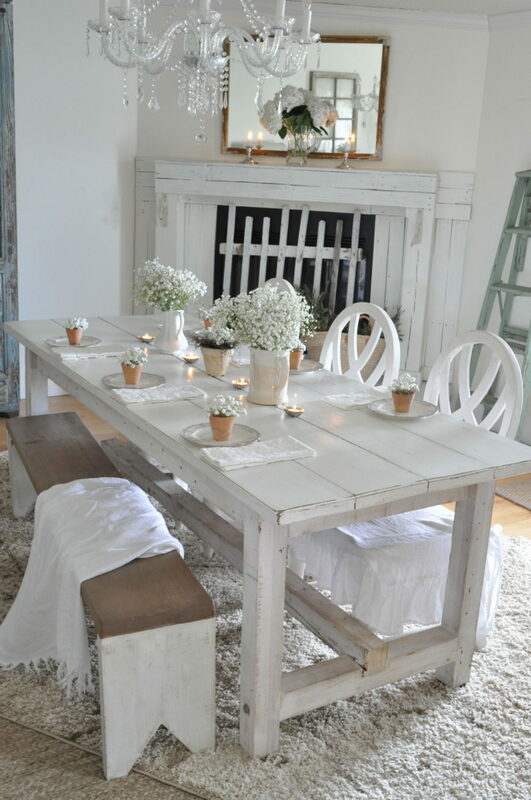 This would be a sweet table for a ladies’ Easter lunch with petit fours and cucumber sandwiches. It’s simple, but pretty. Jovi B, our English bulldog, found a spot in the sunshine during the hour that it shined last week. I was so thankful to photograph with real sunlight. 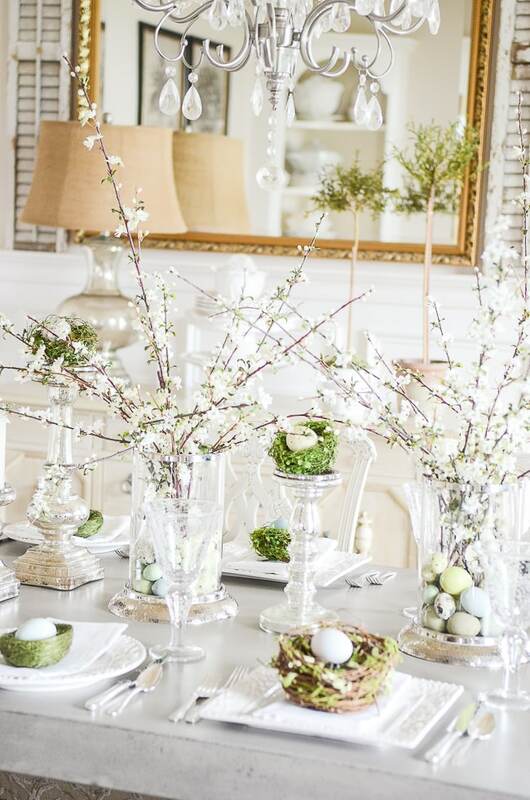 I’m hopeful you will find a little inspiration for your Easter/spring table or decor today…please take some time to visit Kelly at My Soulful Home next. 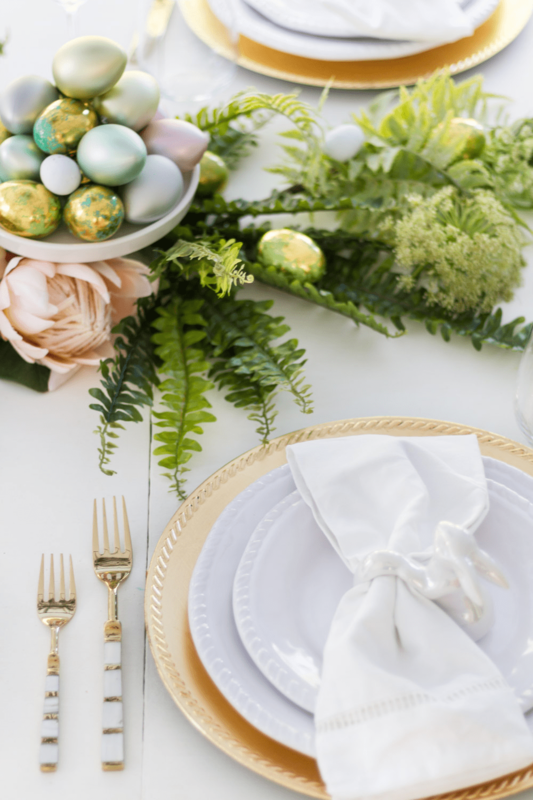 And before you go, leave a comment below to tell me how you are planning to celebrate Easter this year, simple or fancy?? 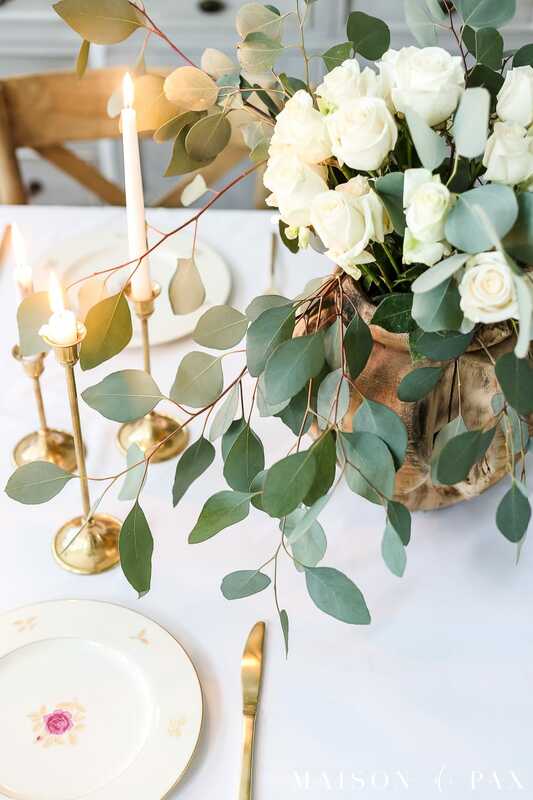 Those simply beautiful and beautifully simple touches are just perfect! 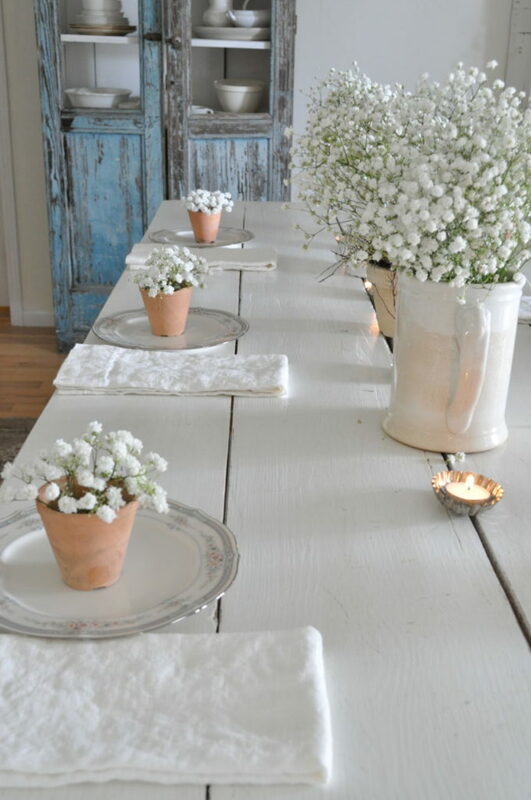 Enjoyed looking at all the light, airy, Springy table settings. They are all fresh and soft with natural touches. 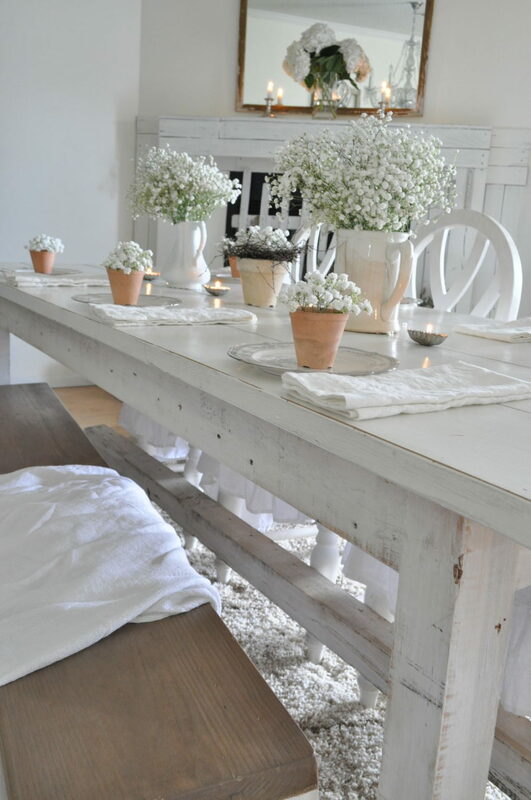 Great inspiration for my table. Thanks. 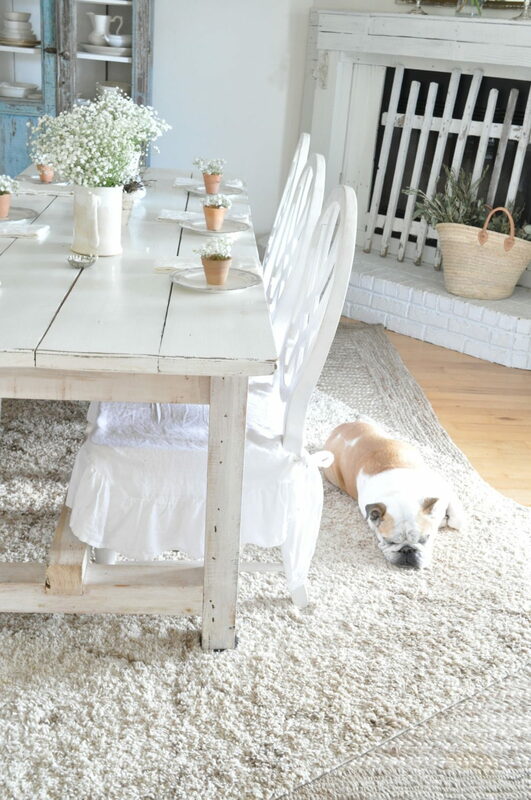 Becky, this table is so very lovely!! The all white theme and country vibe is so pretty! Farmhouse yes, but it feel so European to me and I just love it! Your unique style is quite special!! 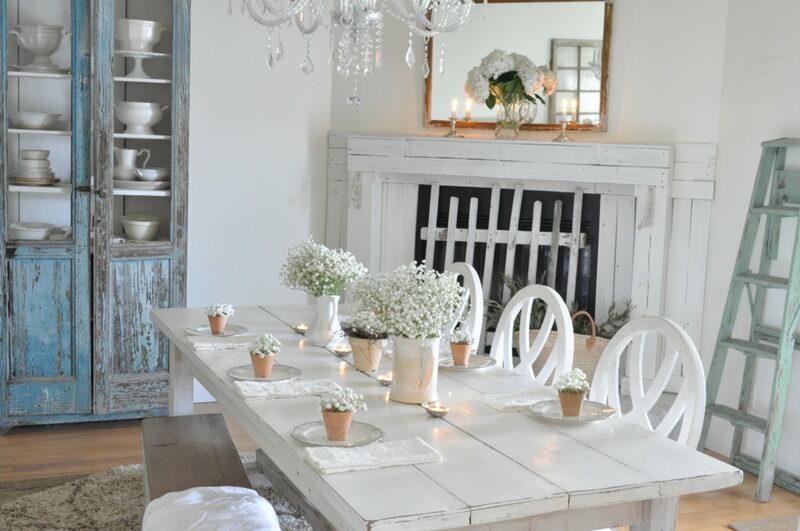 I love the simplicity of your table and mantel. 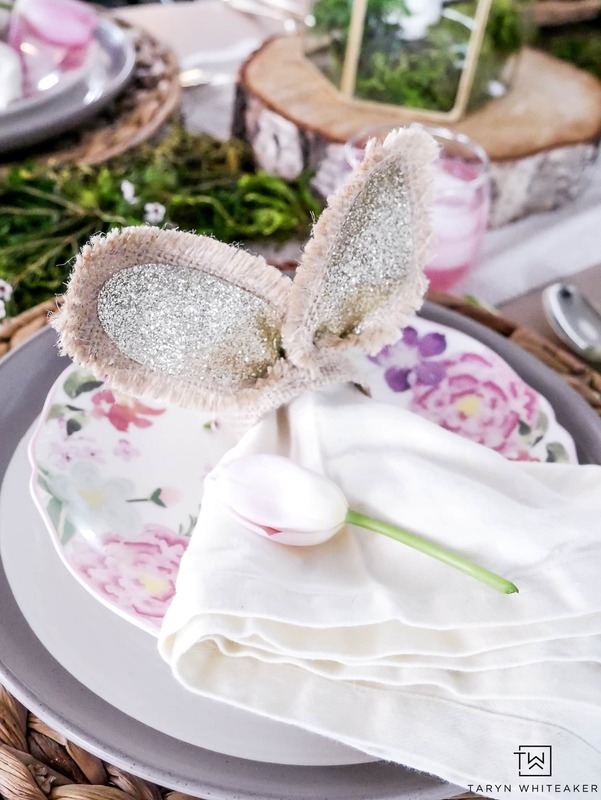 it helps many of us realize we don’t have to have much, nor use much to have a sweet table setting. These are really very lovely pictures. 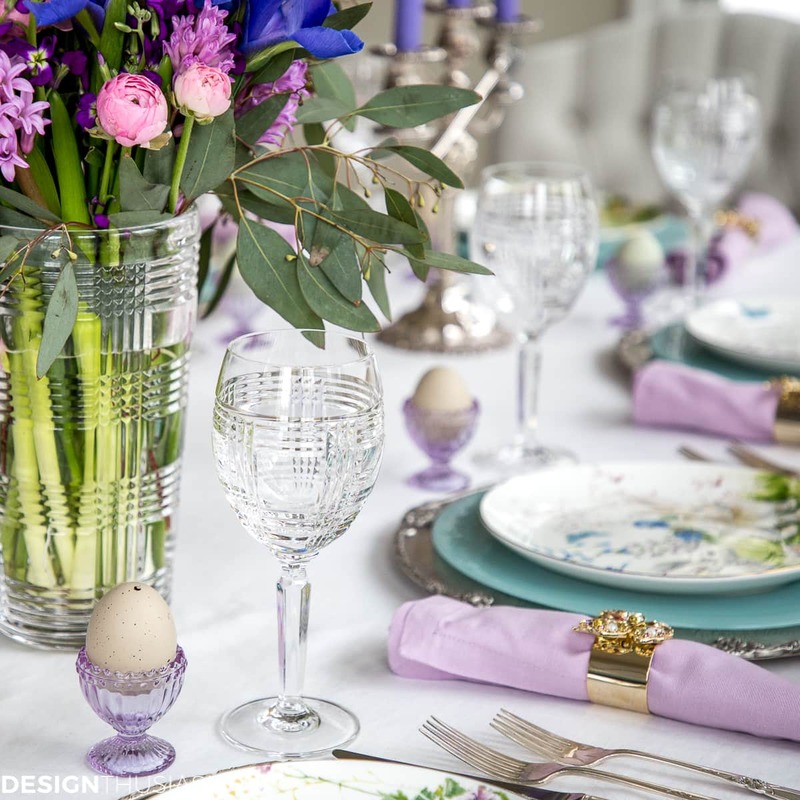 I liked the Easter table decoration. Thanks for sharing this awesome post. 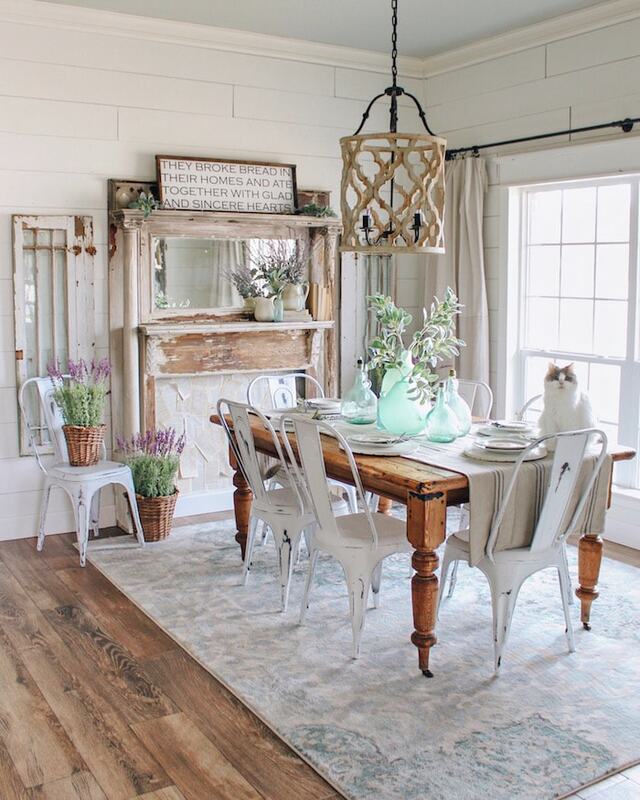 THE WHITE FARMHOUSE TABLE IS SIMPLY CHARMING.